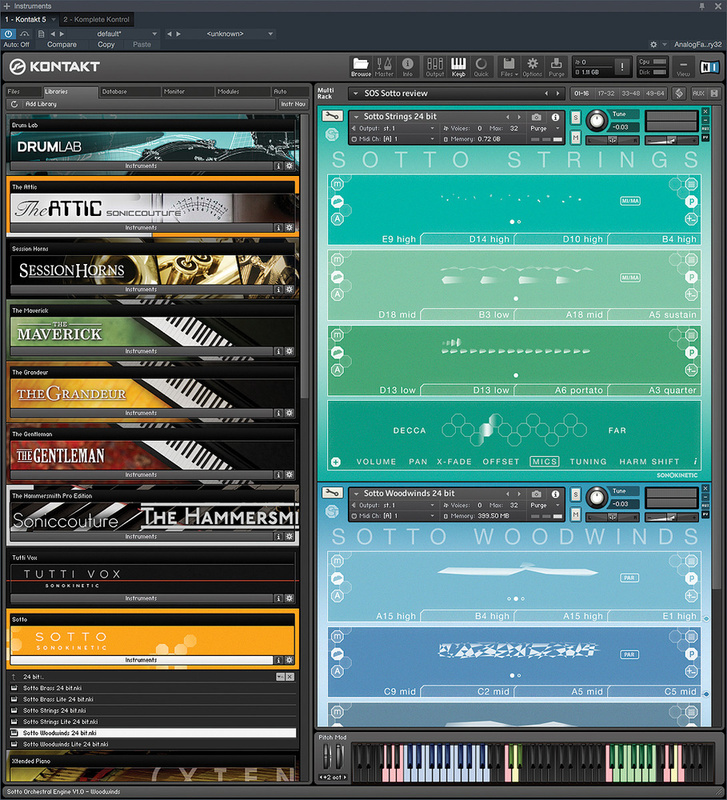 Sotto Strings and Woodwind loaded up in Kontakt 5 ready to be played simultaneously. The graphic score fields in each depict the loaded samples, although there are also more exact coded references (like ‘E9 high’) to what you have loaded. Enter Sonokinetic, the now well-established Dutch sampling house. 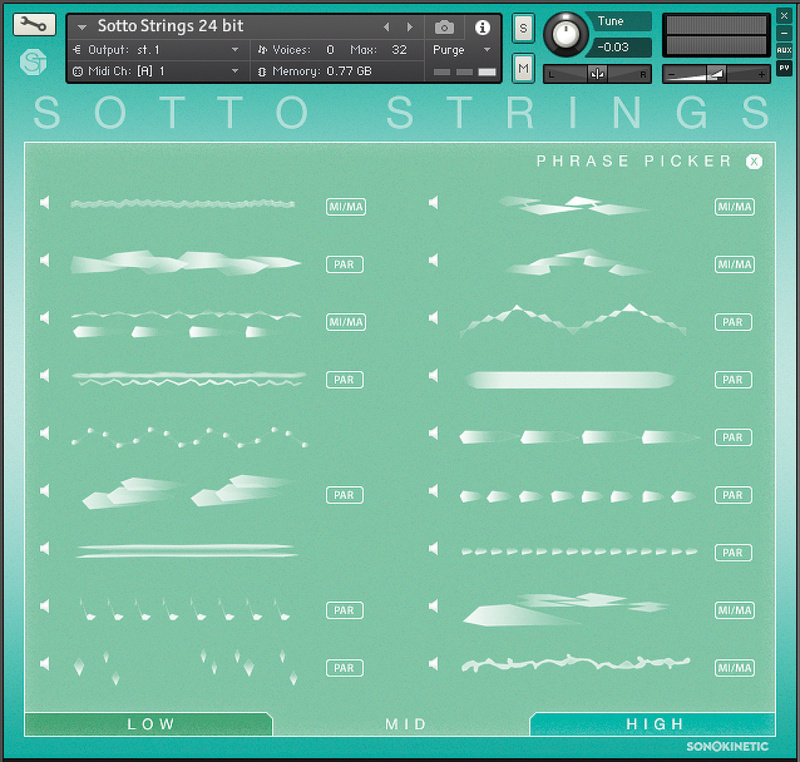 Their range of orchestral sample libraries, of which Sotto is one, rejects multisamples for a flexible and user-configurable loop-based scheme, driven by Native Instruments’ Kontakt or free Kontakt Player. The interface lets you choose from a large repertoire of pre-recorded phrases represented by graphic scores, and you trigger these by playing chords on your MIDI controller. It’s a little reminiscent of the auto-accompaniment feature of home keyboards, but a heck of a lot less cheesy. Kontakt’s time stretching takes care of tempo-sync’ing with your DAW, and various other features add controllability and subtlety to the experience. The result is, genuinely, the sound of a real orchestra, with a richness of subtlety and detail that few multisample programming efforts could ever match. The flip side is the essentially limited nature of the scheme, which keeps you strictly tied to Sonokinetic’s preset selection of musical phrases. It’s an interesting trade-off. Sonokinetic’s existing orchestral libraries are all themed in one way or another. Sotto is no exception, and here the unifying feature is restrained, delicate and sometimes brooding patterns and textures. The name comes from the Italian musical term ‘sotto voce’, meaning ‘under voice’ or ‘quiet voice’, but with the implication of also being restrained in a conspicuous way, like a dramatic whisper. That sums up the general atmosphere quite well, it has to be said. In Kontakt 5.1, where Sotto appears as an official NI-supported Library, you’re offered six instruments in either 16- or 24-bit flavours. That’s Brass, Woodwind and Strings, in normal and ‘Lite’ (fixed mic blend) versions. Oh, and I should say that if you own one of Native Instruments’ light-guide equipped controller keyboards Sonokinetic can supply you with different versions again that’ll do the technicolour key range thing. To walk through how Sotto basically works, and in most of the screenshots here, I’ve chosen the Strings instrument. But Woodwind and Brass work in an almost identical way, sharing the same distinctive interface. What’s plain to see are three graphic-score fields, each sporting various buttons at the left and right edges, and tabs along the bottom. They show what samples are loaded into Sotto at any one time, how they’re set up to behave on playback, and also point to the fact that a single Sotto instrument does indeed consist of up to three simultaneous playback layers. The full repertoire of Sotto samples is revealed when you open up a field’s Phrase Picker. Click centrally in any of the three fields, and Sotto pops up a Phrase Picker window, from which any of over 50 loops (some with several variations), categorised into Low, Mid and High pitch categories, can be auditioned or loaded. The three fields aren’t limited to loading a Low/Mid/High combo, but could just as easily carry three Low phrases, or a Mid and two Highs, or any combination you like. The tabs further let you set up rand quickly access not just one but four ad-hoc phrase-combo ‘presets’. So with phrases loaded, how do you actually trigger and hear them? That’s done simply by playing a major or minor triad (in any inversion) in the C1-G2 key range, shown in blue in Kontakt’s keyboard display. Sotto immediately springs into life, with the three phrases sounding simultaneously, and sample variations automatically selected that work for the harmony you’re playing. The original phrases were recorded between 110 and 120 bpm, but much broader tempo sync with your DAW is taken care of behind the scenes by Kontakt’s Time Machine Pro feature. Even if you were to dig no further into Sotto’s capabilities, the results at this early stage can be hugely impressive. Releasing a chord will trigger (for most loaded phrases, at least) a set of release samples, which not only round off phrases convincingly, but can also be used creatively, for syncopated endings (for example). However, a continuous effect with smooth chord transitions can be achieved by using brief chord-presses in conjunction with your sustain pedal permanently depressed, or by simply continuing to hold any MIDI note until a new recognisable major or minor triad is formed. Sotto crossfades from between its many thousands of internal sample loops, instantly and believably. From here on, it’s all about the detail of the implementation. For example, the pink/green key range beneath the blue chord recognition area is a set of real-time layer mutes. They’re MIDI commands for the little ‘m’ buttons in each layer, and are very much meant to be played in real time, allowing you to build or thin textures on the fly. Most of Sotto’s real-time control is done via keyswitches. You’ll be glad of the built-in crib sheet while you’re learning the system, and it’s all a whole lot easier if you have an 88-note controller keyboard. Another key range, above the chord area, contains real-time switches for the four phrase combo presets I mentioned above. Preset changes also transition smoothly, even mid-phrase. As for the other buttons festooned at the end of each phrase row, they control various useful aspects of operation. On the left side there’s the ‘m’ layer mute I mentioned already. The little ‘mod wheel’ button beneath ties layer volume to incoming mod-wheel data when engaged, letting you do controlled swells on any combination of layers. The ‘A’ relates to tempo sync, and indicates that Sotto will automatically double or halve phrase playback speed to best match some extreme DAW sequence tempos. Other options, to force normal, double or half-speed playback, can force the time stretching to extremes, which for some users will be a desirable effect. An overlay for each phrase field puts meat on the graphic score bones, and lets you see the notation Sotto’s orchestra played from. The ‘drag midi’ feature at top right lets you get matching MIDI notes into your DAW for layering other instruments with the same material. 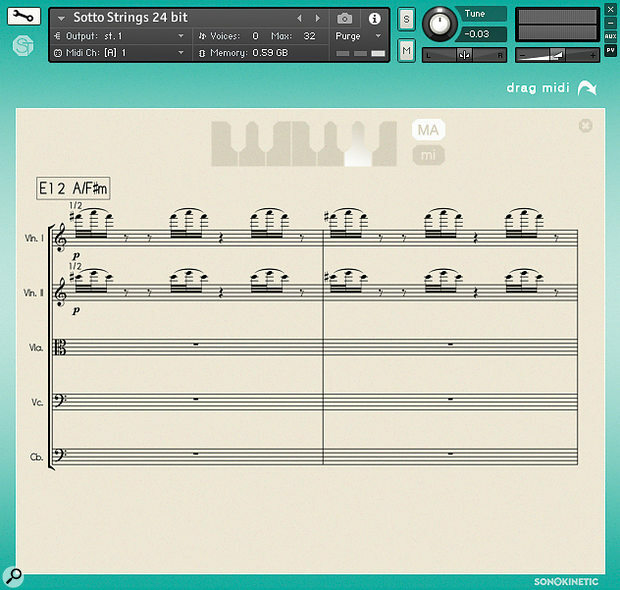 At the right side, clicking the uppermost button displays a conventional musical score for the currently loaded sample — the same one that the orchestra recorded for Sotto originally played from. A clickable keyboard display lets you examine how the phrase varies in different keys, and a MIDI drag feature lets you drop identical multitrack MIDI phrases into you DAW. This feature has nothing to do with how you drive Sotto from your DAW, but is provided so you can easily layer other MIDI-driven synths and samples with identical musical material — a really useful and thoughtful feature. The ‘P’ button purges from your RAM the samples for the currently selected preset/tab, which can be useful if you happen to be struggling with memory usage. Finally, the ‘+-’ button switches on the Harmonic Shift feature for the layer — see the box for more on that. What, I hear you whisper dramatically, is Sotto’s usually-empty bottom field for? Well, the ‘i’ button calls up a labelled overlay that reminds you what all the various bits of the interface and its MIDI key ranges do. The ‘+’, on the other hand, accesses global-level features like control of phrase mix level and pans, inter-harmony and inter-preset crossfade smoothness, and phrase timing offsets ranging from subtle ‘feel’ tweaks to beat-shifted polyrhythms. The Mics tab reveals that Sotto’s phrases were captured at four mic perpsectives — Close, Decca (tree), Wide and Far — and then lets you load any one, or choose two and blend smoothly between them. There’s also a master Tuning feature, referencing the various worldwide orchestral tuning standards from A=440 to A=443Hz. But this really only automates the ‘Tune’ parameter that any Kontakt instrument is by default equipped with, so adjusting that directly allows Sotto to adapt to a far wider range of pitch standards. While Sotto very effectively responds to major and minor chords played in its chord recognition keyrange, it ignores any other kind, not least sevenths, ninths, diminished chords, or any kind of suspension. Surely that’s a huge limitation, especially for symphonic-style movie music, depriving your arrangements of harmonic sophistication? Actually, it turns out not to be. First of all, many sampled phrases do contain chord extensions, and suspensions, and cluster-like qualities — they just happen to be triggered from simple majors or minors. To that end, most contain specific variations to harmonise (literally) with major and minor tonalities, or otherwise exist in ‘gender-neutral’ modal forms that work with either. The configuration controls for Harmonic Shift are a touch intimidating, even if you’re up on your music harmony. But the good news is that their use is entirely optional. Harmonic Shift is much more a feature you interact with by playing, in real time. But there’s also a Harmonic Shift feature, which transposes one or more layers relative to others. Phrases with the feature switched on still all respond to the basic chord recognition, but they’re subject to further transposition in response to key presses in a high octave-wide keyrange, in real time. To give a simple example, you might have block chord phrases loaded in two layers, and a single held bass note in the third, with its Harmonic Shift feature enabled. Playing chords trigger all the phrases as normal. But if you were to now play single notes in that high keyrange the bass note layer would move around independent of the other two, letting you create inversions, dissonances, and even melodies. Many other creative possibilities exist, like loading the same phrase into two parts, one with Harmonic Shift engaged, one without. Now playing C# in the keyrange puts those phrases a semitone apart, creating Bernard Hermann style dissonances. With a bit of lateral thinking and compatible phrases, and using the dedicated controls in the global parameter field, Harmonic Shift lets you create extended chords and suspensions quite controllably. But it’s also an inspiring feature to play around with even if you couldn’t care less about what’s happening, music theory-wise. The details of operation are all very well, but how does Sotto sound and perform in normal use? Well, despite its non-standard nature, the Sotto interface and feature set is easily learnt. Actually if you find a few minutes to watch the four instructional videos that arrive as part of the installation you’ll have mastered them in no time. Those videos are refreshingly clear and devoid of waffle, and nicely judged for the typical user Sotto is likely to end up with. They also give crucial information about best practice for recording and playback in your DAW. Sotto’s repertoire of phrases has been thoughtfully assembled. In all orchestral sections, in each of the Low, Mid and High groupings, there are looping bar-length held notes, simple repeated-note patterns, swells, elegantly-voiced chords, driving ostinatos, and more ambitious quasi-melodic patterns and clusters. This breadth means that Sotto can work for short spot effects as well as much longer rhythmic sections. The style is unapologetically symphonic, and as I worked my way through the phrases I was continually reminded of great film scores from the last few decades. At the same time, I could see how the Strings instrument, in particular, could drop right into many pop productions. It’s all very Philip Glass, but also reminded me of some Divine Comedy arrangements. The orchestral performances are nearly all excellent, and it’s only a very few phrases (like the tired-sounding Brass ‘D2 mid’, in a few of its key variations) that are not quite up to snuff in terms of intonation or tonal quality. Simple features like mod-wheel volume and MIDI note drag do much to increase the scope of Sotto, but Harmonic Shift adds a level of control that can almost make you think you’re using a note-driven multisampled instrument. Either way, Sotto’s way of working is fast, fun and compositionally fruitful, and the ever-present quality of the musical performances is continually inspiring. I also love the way that the various instrumental sections are designed to work together and to be loaded side by side in a single instance of Kontakt, to form a full-on orchestral ensemble. Each section gets its own mute and preset-change keyranges that complement the others, so you can be switching brass phrases on and woodwind phrases off, for example, while string phrases continue on uninterrupted. Using Sotto for music that’s not in four beats in the bar is interesting. It’s not actually a deal breaker if your piece is in 3/4 or 5/4, because judicious use of the release-sample functionality can make phrases sound finished even when they’re only partially completed. Compound meters like 12/8 are also still workable, especially if you keep your DAW in 4/4 and think in triplets instead. But these are the times at which you’re reminded that Sotto is, after all, just a big bunch of preset accompaniments, with very limited ability to adapt to anything outside its norm. Frequent DAW meter changes can occasionally throw off Sotto’s internal sync, but at least Sonokinetic have dealt with that eventuality with a ‘hidden’ keyswitch that resets things when they go awry. They’ve also provided sophisticated options (via yet more keyswitches) for Sotto to deal with those moments when you need phrases to begin part-way through, mid-bar. And thinking about the implementation in Kontakt, it’s all very reliable and elegant, except for one thing. At small DAW buffer sizes, lower than 256, I could generate audible glitches when changing harmonies, even when using just one Sotto instrument. This was true for both DAWs I tested with — Presonus Studio One v3.2 and MOTU DP v9.02 — with samples streaming from a USB 3 solid-state drive that was achieving a transfer rate of over 420MB/s. With bigger buffers the problem went away, and I suspect it’s more Kontakt’s fault than Sotto’s anyway, but it’s definitely a quirk that would need to be borne in mind in use. Other downsides? Well, it’s not cheap, but it’s probably a fair price for the massive sampling and programming effort it represents. And how much would it cost you to hire a hall and orchestra for the day? The strung-out key ranges pretty much demand you have an 88-note MIDI controller to access them all simultaneously (which you will often want to). On that score, I wish the mostly empty lower field in the user interface actually displayed its key range graphic, rather than nothing, by default. Even NI Komplete Kontrol keyboard owners would benefit. I’d have loved some percussion phrases too, like some timp rumbles, and minimalistic mallet loops. All in all, though, Sotto is another success from Sonokinetic. Yes, it’s a preset machine, but that’s the whole point of it; it’s designed to give impressive results instantly, with almost no effort. There’s enough user control on offer, though, to break through those preset bounds, and allow for more experimental and creative use. It’ll complement a traditional multisampled orchestral library beautifully, but could easily power many a movie cue and pop production all by itself. A full installation of Sotto is 60GB. That’s just under 20GB for its 16-bit sample set, 40GB for an otherwise identical 24-bit sample set, and a few other bits and bobs like the Kontakt instruments themselves, manuals and some instructional videos. As a downloadable product you’ll be thankful for Sonokinetic’s download manager application, which adds robustness to the process and takes care of installing samples to your desired location. Sotto is also available on a USB stick, though, for an additional €25. If you’re thinking, like me, that the 24-bit samples should be 50, not 100 percent larger than their 16-bit counterparts, I’m afraid I have no explanation for you, other than to suggest it might be something to do with Kontakt’s NCW format compression scheme. Both sample pools were captured at 44.1KHz, and to my ears sound identically good. You can install either one, or both. As for computer specs, you need something that’ll run Kontakt 5.1 or its free Kontakt Player offshoot, so at least OS 10.9 or Windows 7, on an Intel Core 2 Duo chip or better, and with 4GB RAM minimum. And then bear in mind that Sonokinetic instruments, while not absolute CPU hogs, don’t hold back on resource usage. Sotto relies on multiple simultaneous time-stretch layers and loading of dozens of concurrent samples. Run it on a decent spec computer built in the last few years, with plenty of RAM, and you shouldn’t have any difficulties. Spot the difference. Brass and Woodwind instruments have a little extra handle extending from the right of their phrase fields. Drag that up and you’ll hear extra breath noise in the samples... sometimes. I mentioned that all three Sotto instruments — Strings, Brass and Woodwind — have the same capabilities. That’s true, except for one thing. Brass and Woodwind have an additional slider on the right-hand side of each of their phrase displays, that controls the amount of breath noise on each phrase layer. It’s a nice idea, probably done with behind-the-scenes EQ or a filter. With plenty of Close mic perspective in the mix, and the little sliders all the way to the top, you can get more of that intimate, breathy quality that really suits some moods. It’s rarely more than a subtle addition, though, and I have to confess I could hear no difference at all when adjusting the slider for a large cross-section of Woodwind phrases. It’s generally more pronounced with Brass though. High-quality, real-deal orchestral performances with no hint of clunky multi-sample articulation. Easy-to-use Kontakt interface, with optional Komplete Kontrol integration. Strings, Woodwind and Brass can be driven simultaneously for whole-orchestral textures. Harmonic Shift and other real-time controls almost make you forget it’s a preset instrument. Great instructional and support material. If you can’t find a phrase to suit your needs, or adapt one with the provided real-time control features, Sotto has little more to offer. Audible glitches when used with small DAW buffers. Another fascinating orchestral phrase library from Sonokinetic that wears its complexity very lightly. Sotto lets you generate convincing orchestral textures, of subtle, ominous and delicate character, with the greatest of ease. Apple iMac Retina 5K 3.3GHz Intel Core i5, 8GB RAM, OS 10.11.3.